“Air quality laws for particulate matter (PM10) were breached in London in each of 2005, 2006 and 2007. Maps obtained by the Campaign for Clean Air in London reveal that the government still expects these laws to be breached in London in 2011 and beyond. In addition, air quality laws for nitrogen dioxide (NO2) require at least a one-third reduction in that form of air pollution near London’s busiest roads by January 2010. “The UK will be subject to legal action for breaching air quality laws for PM10 unless it notifies the European Commission (the Commission) by 31 October 2008 of a request for a time extension and provides plans to eliminate all UK breaches of air quality laws for PM10 by 2011 (or earlier). In CCAL’s view, the UK will struggle to justify such a time extension. This may explain why the government currently plans to miss this new deadline by eight months or more – amazingly, given that the over-riding obligations have been in legislation since 1999. “The government needs to agree radical new plans with Mayor Johnson within weeks that will reduce sharply air pollution in London if the UK is to stand any chance of avoiding legal action for breaching air quality laws based on World Health Organisation recommendations. Realistically, a two-month public consultation needs to be launched by Mayor Johnson by 31 October 2008 with detailed plans to meet fully obligations for PM10 and NO2, if businesses and the general public are to be given sufficient notice of the major changes required of them by January 2010 (e.g. in road transport). “The air quality plans will almost certainly need to include one or more additional, inner, Low Emission Zones (LEZs) in London with standards for the abatement of hazardous emissions from the most polluting vehicles of all sorts. These inner LEZs will need to set tighter standards, for both particulate matter and emissions of oxides of nitrogen than the existing London-wide LEZ. Dozens of cities across Europe are already planning such LEZs to comply with the same air quality laws. “After nearly 10 years, the government has finally run out of excuses. Ironically, with just 61 days to go before the Commission launches legal action against the UK for breaching air quality laws for PM10, the Labour government is dependent now on a Conservative Mayor of London to save the UK from the harsh reality of unlimited fines. The maps and letters referred to in this Campaign Update are attached to it. The UK was required by 1999 legislation to reduce the public’s exposure to particulate matter (PM10) air pollution. Air quality laws required two ‘Limit Values’ to be met by 1 January 2005: an annual average exposure not to exceed 40 micrograms per cubic metre (μg/m3) and a daily mean exposure not to exceed 50 μg/m3 on more than 35 days per annum. The UK breached both Limit Values in each of 2005, 2006 and 2007 and has no plans yet to comply with the daily mean Limit Value across London. The new European Union (EU) Directive on ambient air quality and cleaner air for Europe (the new AQ Directive), which entered into force on 11 June 2008, gives the UK and other Member States the opportunity, subject to strict conditions, to seek a time extension to comply with air quality laws for PM10 until 2011 with dispensation from breaching these air quality laws in 2005, 2006 and 2007. One of these strict conditions is that the government must show how it will eliminate all breaches in the UK of air quality laws for PM10 by 2011. CCAL therefore asked the Department of Environment, Food and Rural Affairs (Defra) to release detailed maps showing the remaining locations in the UK where air quality laws for particulate matter (PM10) will still be breached in 2011 and beyond i.e. the places where the government is unable currently even to meet a key condition for a time extension. Defra provided those maps which are attached to this Campaign Update. The government maps show that the only remaining breaches in the UK of air quality laws for PM10 by 2011 are forecast to be the daily mean Limit Value along about 40 kilometres of roads across some 13 boroughs in London. The government expects to have eliminated from the UK all other breaches of air quality laws for PM10 before 2011. The government maps show in red the sections of the roads in London that are expected to exceed an annual average concentration for PM10 of 31.5 μg/ m3 in 2011. This is the government’s best estimate of the places where PM10 exposures will exceed 50 μg/ m3 on more than 35 days in 2011. The government adopts this widely accepted mechanism since it would be difficult to forecast now which days in 2011 might exceed a mean of 50 μg/m3. The government has no plans yet to comply with air quality laws for PM10 near these roads. As mentioned earlier, the new AQ Directive gives the UK the opportunity, subject to strict conditions, to seek a time extension to comply with air quality laws for PM10 until 2011 (or earlier) with dispensation from breaching these air quality laws in 2005, 2006 and 2007. One of these strict conditions is that the government must show how it will eliminate across the UK all breaches of PM10 air quality laws by 2011 (or earlier). 6. if the UK misses the deadline of 31 October 2008 and/or does not submit an air quality plan that satisfies the Commission that it will eliminate the breaches of Limit Values for PM10 in London, it will be subject to legal action for breaching these Limit Values in 2005, 2006 and/or 2007. This will involve the Commission asking the European Court of Justice (ECJ) to require the UK to remedy these breaches immediately (i.e. no delay allowed until 2011). If the UK fails to comply with ECJ’s requirements, the Commission can ask the ECJ to impose unlimited lump sum and daily fines against the UK. The government has admitted that it plans currently to launch yet another public consultation in early 2009 on its plans to comply with Limit Values for PM10 with a view to submitting a time extension notification request to the Commission by ‘summer 2009’. This timetable clearly sets the government on a collision course with the Commission and the ECJ. Worse still, the government does not plan to commence a consultation on measures to comply with air quality laws for nitrogen dioxide until 2010. Its current consultation on NO2 is intended to meet only the requirements of historic air quality laws not those of the new AQ Directive. Similarly, Mayor Johnson’s letter to CCAL states he plans to launch a public consultation on his Air Quality Strategy by June 2009. “In CCAL’s considered view, the government will struggle to obtain a time extension to comply with air quality laws for PM10. How can the UK argue that: it has ‘street canyons’ everywhere; climate change has been with us for years already; or that transboundary particulate matter has been arriving in the UK against the prevailing winds? What measures did the UK take before 2005 at a national, regional and local level that made a real difference to air quality? 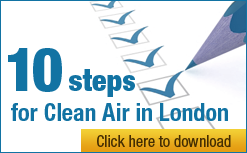 Where are the plans to comply with air quality laws across London by 2011? “In an approach that will compound the government’s difficulties, its plan to miss the Commission’s deadline of 31 October is cynical and irresponsible: it will miss by months the Commission’s reasonable deadline for submitting a notification for a time extension and will instead coincide with the June 2009 elections for the European Parliament (with all the changes that will entail); and it will give businesses and the general public little notice of the major changes needed by January 2010 (e.g. in road transport). “As if this was not bad enough, the government wants to: take advantage on the one hand of the new AQ Directive’s technical flexibilities for time extensions for PM10 (without accepting the Commission’s counterbalancing requirements for compliance with the new AQ Directive); and on the other to take advantage of historic air quality laws for NO2 (accepting in full the Commission’s proposals following the introduction of the new AQ Directive). “If the new AQ Directive had not entered into force, the government would have had to notify the Commission by 31 December 2008 under historic air quality laws of its plans and programmes to comply with Limit Values for both PM10 and NO2. The new AQ Directive reinforces air quality laws for NO2 and adds special conditions for any time extension e.g. that the UK would need to ensure average annual NO2 remains below 60 μg/m3 from 1 January 2010. “A responsible government would: meet the Commission’s deadline of 31 October 2008 for requesting a time extension for PM10; and undertake a national consultation now on its plans to comply with existing Limit Values for NO2 under historic laws combined with contingency plans to comply with the new AQ Directive if it breaches those Limit Values from January 2010 as already looks certain. CCAL obtained, under the Freedom of Information Act, a copy of the letter written by Jonathan Shaw MP, Minister for Air Quality, to Mayor Johnson dated 21 July 2008. The full text of that letter appears at the end of this Campaign Update and a copy of the letter is attached separately. Mayor Johnson replied in a letter dated 31 July 2008 to various requests from CCAL to him to clarify his attitude towards improving air quality in London and compliance with air quality laws. The full text of that letter appears at the end of this Campaign Update. “The Campaign for Clean Air in London (CCAL) is pleased to have received a personal letter from Mayor Johnson with reassurance that he is “passionately committed to improving air quality in London” and “committed to taking bold action to try to meet the requirements” of air quality laws. iv. How much notice does Mayor Johnson plan to give businesses and the general public of the major changes required of them in London by January 2010 (e.g. in road transport)? 1. The lower annual average test used for the daily mean Limit Value for PM10 reflects the fact that this standard is harder to meet, in general, than the annual average Limit Value. 2. Fine particulate matter (so called PM2.5) comprises typically 60-70% of PM10 i.e. the annual average Limit Value for PM10 of 40 μg/m3 is equivalent to a figure of about 25-30 μg/m3 of PM2.5. The World Health Organisation (WHO) says there is no safe exposure to particulate matter and recommends a maximum annual exposure of no more than 10 μg/m3 of PM2.5 i.e. much less than half the level implied by the annual average Limit Value for PM10. 3. Defra recently discovered a problem measuring PM10 in 2004 and 2005. CCAL understands though that this problem affected only measurements made using the ‘gravimetric’ method at about 12 sites across the UK. Three monitoring sites in London could have been affected: Earls Court Road (Kensington and Chelsea 5), Foxham Gardens (Islington 4) and Duncan Terrace (Islington 5). However, CCAL understands that the entire excellent London Air Quality Network, including those three sites, was unaffected by the problems. Thank you for your correspondence about improving London’s air quality. Air pollution has a significant impact on Londoners’ health and quality of life and I am passionately committed to improving air quality in London. I welcome the support of Londoners and London organisations, such as the Campaign for Clean Air in London, in working towards this goal. I am committed to taking bold action to try to meet the requirements of the EU Air Quality Directive and the National Air Quality Strategy. This includes technology based solutions, such as increasing the number of hybrid buses on our streets and investing £1 million to trial low emission taxis. I am also implementing measures which encourage behavioural change, such as the implementation of the Low Emission Zone, encouraging smarter travel choices and promoting best practice on construction sites. However, I am aware that full compliance with the Air Quality Directive may not be possible without action taken to reduce pollution coming into London from the rest of the UK and overseas. Therefore I will also be lobbying the UK Government to help me implement key measures and encourage best practice elsewhere, and the European Commission to set stringent emission reduction targets for key sources of pollution. I was interested in the issues and impacts you highlight about areas where NO2 concentrations [which] exceed 60 μgm-3. I am keen that all issues are considered in my decision on the Western Extension Zone, and request you submit a formal response to the consultation in September. I will be setting out all my policies and proposals to improve air quality in my Air Quality Strategy, which will be released for consultation by June 2009. This will consider the best way of working towards national and European air quality standards. I welcome your contribution to this important debate, including the ideas you set out in your letters of the 13 and 14 July, which I have passed onto [to] my policy teams. I am keen to find out more about the aims of the Campaign for Clean Air in London. My policy advisers are meeting key stakeholders and will be in touch with you soon to set up a meeting. London continues to be in the vanguard of major cities with innovative policies in place to ensure improved air quality for its citizens. I am aware that since becoming Mayor of London you have taken a number of steps to ensure that this remains the case, including support for the London Low Emission Zone, the announcement of £1 million worth of funding to trial low carbon technology in London’s taxi fleet, and the announcement of Low Carbon Zones across London by 2012 which, managed well, should improve air quality as part of the scheme’s wider benefits. However, although London has some of the worst air pollution in the country, there are only a small number of areas projected to exceed an EU limit value for particulate matter in 2011 (as set out in the recently adopted Air Quality Directive 2008/50/EC), and these will be the last remaining exceedances in the UK. I am therefore writing to you to ask that we work together with the aim of meeting our air quality objective for particulate matter in London by 2011 and thereafter. As you will be aware, air quality limit values, and the deadlines for meeting these limit values as set out in Directive 2008/50/EC, are legally binding on the UK. The objectives in the Air Quality Strategy for England, Scotland, Wales and Northern Ireland are derived from these limit values, as are the objectives contained in the Mayor’s Air Quality Strategy published under section 362 of the Greater London Authority Act 1999. The objective for particulate matter was due to be met in 2005, but in recognition of the fact that almost all Member States are finding this objective very challenging, Directive 2008/50/EC enables Member States to apply for compliance flexibilities to extend the deadline for meeting the particulate matter objective to 2011. The UK, along with a number of other Member States, intends to apply for this compliance flexibility, which is conditional on us putting forward a plan of measures to the European Commission demonstrating how we will meet our objective for particulate matter in those zones where there are projected to be exceedances (i.e. London) in 2011, and how we have already met, or will meet, the particulate matter objective in other areas between 2005 and 2011. The remaining exceedances are caused primarily by road transport, and my Department will be publishing a consultation in the new year on options for meeting our particulate matter objectives. My officials wish to work closely with your officials, Transport for London and the London boroughs in which the remaining exceedances are projected to occur to develop proposals for consultation. Working together on this, I am confident that we can develop a package of measures that will meet our air quality objective for particulate matter in these last few remaining areas of London and thus improve the quality of air Londoners breathe. We should not under estimate the scale of the task, and will also need to develop further national, as well as local, measures in due course to meet our objective for nitrogen dioxide. I am copying this letter to the chief executives of Barking and Dagenham, Camden, City of London, Cities of Westminster, Greenwich, Hackney, Hammersmith and Fulham, Islington, Lambeth, Newham, Kensington and Chelsea, Southwark and Tower Hamlets. These are the areas where the last few exceedances are projected to occur in 2011, and my officials have sent yours’ maps detailing these exceedances. Thank you for your letter of 16 June to Gordon Brown about the new EU Directive on ambient air quality and the Government’s commitment to air quality laws. I am replying as Minister responsible for this policy area. The UK Government is committed to protecting the public from the harmful effects of air pollution. The Air Quality Strategy sets out actions to be taken to move the UK towards meeting the national air quality objectives and comply with EU limit values. The Air Quality Strategy was published in July 2007 following a review of the previous strategy, and proposed new additional policy measures to improve air quality and set an agenda for the longer term. The review took into account the implications of climate change and the need to align actions to improve air quality with the aims of the Climate Change Bill currently going through Parliament. The Government remains committed to meeting the air quality objectives and will be considering the need for further action in the context of the flexibilities available under the new air quality directive. The Government will continue to work with key partners to maintain the highest justifiable level of health protection.